The Quality Built software solution features reporting on all open items. The power of the platform is its ability to coordinate and report to stakeholders, project managers and superintendents simultaneously, escalating issues per your compliance metrics. 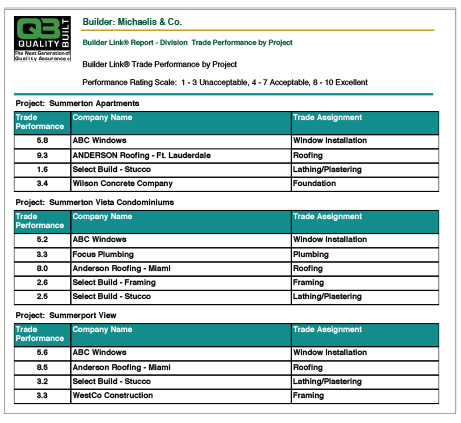 Quality Built has extensive knowledge and advanced service for our builders. These include Design Consultation/Product Specification Review, Forensic Services, ASTM Water Testing, HOA Turnover, Mock-Up Documentation, Product and Material Inventory and Tracking, and Geotechnical Services. In addition, our knowledge base is one of the largest libraries available. Please click on our Advanced Services or Education Support and Training to learn more. Utilize Quality Built’s digital documentation and HomeID®, a homeowner inventory tool, at no additional cost.